Ballyvaughan is a lovely little village on the road out to Doolin in North Clare. Voted one of the 10 best road trips in the world by Condé Nast Traveller, it never disappoints whatever the weather. Picture postcard pretty, it nestles in the heart of the Burren against a sheer backdrop of mountains all the way out to magnificent Black Head. Only over the road from where I live it’s where I go for the paper on Saturday mornings or for a wander around the farmers market during the summer, which also includes an excellent craft fair in the Old School every Sunday. Village life centres around the Spar shop which is well stocked with a great deli counter and a good wine list. The resident ‘fat cat’ lounges around outside cadging titbits from tourists waiting for the bus to Doolin. Just behind the carpark is Linns' Fashion which stocks plenty of weather friendly gear as well as travel books and information about the area. Ballyvaughan though small, has a bit of everything pubs, hotels, restaurants, coffee shops and even an international college of art. There are plenty of gift shops including Quinns (traditional crafts) and Lillimar (more contemporary) with nice jewellery and homeware items just next door to the Soda Parlour which makes excellent crepes and wicked deserts. 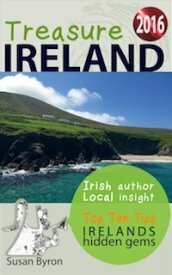 Ballyvaughan is heaven on a fine day with a small perfect beach at Bishopsquarter (that is never packed) the gorgeous Fear Gorta (hungry grass) Cottage Tearooms where believe me you will never go hungry. And all of this in the rampant floral paradise that is the Burren in early summer when alpine flowers such as blue gentians, mountain avens blend with wild orchids and purple geraniums. A new festival celebrating this unique phenomenon, the Burren in Bloom takes place the whole month of May with plenty of walks and talks among the flowers. 1 Ailwee Caves & Birds of Prey Centre is a good rainy day alternative with a well stocked farm shop selling their own award winning smoked cheeses and other locally produced artisan foods such as the Burren Smokehouse Salmon . 2 Gregans Castle small luxury country house hotel, beautiful décor, check out the Piper water colours in the lounge. Excellent restaurant for dinner (expensive) lunch or afternoon tea (an affordable option) with a lovely view down the valley. 3 An Fear Gorta on the harbour. Charming cottage tearooms, with a conservatory or you can eat in the garden, wonderful selection of homemade cakes. Steven Spielberg is a regular patron. 4 Monks' Pub on the harbour, great fire with traditional music at the weekends, pub grub, good chowder & seafood platters. 5 O’Loclainn's Whiskey Pub only open in the evening, one of the finest in the country, they even have a whiskey menu! very nice old world interior & exterior. 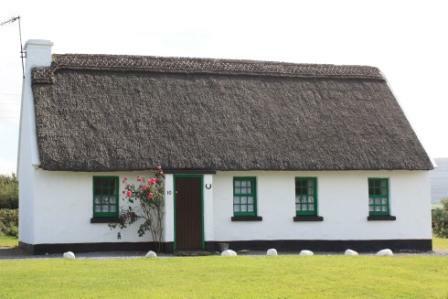 6 Rent an Irish Cottage they are just so pretty and so popular and (affordable) off season, great location for touring the Burren. 7 Drumcreehy Guesthouse beside Bishopsquarter Beach, stunning views out over Black Head, well run by an Irish lady married to a German lad, very friendly. 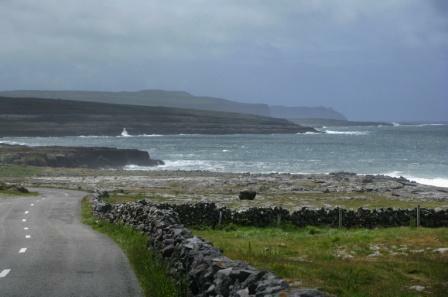 8 Drive out to Blackhead park up at the lighthouse and climb up to the stone fort or take a more leisurely walking route along the green road from Fanore, for great views of Aran Islands and Galway Bay. 9 Burren Crafts a long established association of local craft producers, very good quality, reasonably priced crafts every Sunday throughout the summer in the Old School. 10 Ballyalban Fairy Fort easy access via wooden stile to this impressive ring fort with mature trees. You will find it on the right hand side of the road just after left hand turn up to the Ailwee caves on the way up to Poulnabrone. who are extremely kind, courteous and patient! Trips take about an half a day and cost €50 with all the gear including wet suits supplied. 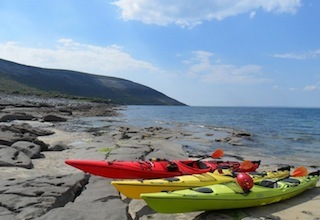 They also do a variety of other trips including Sunset Paddles and a Cliffs and Caves Tour in Liscannor Bay. For more about Ballyvaughan & the Burren in Bloom Festival please click here.